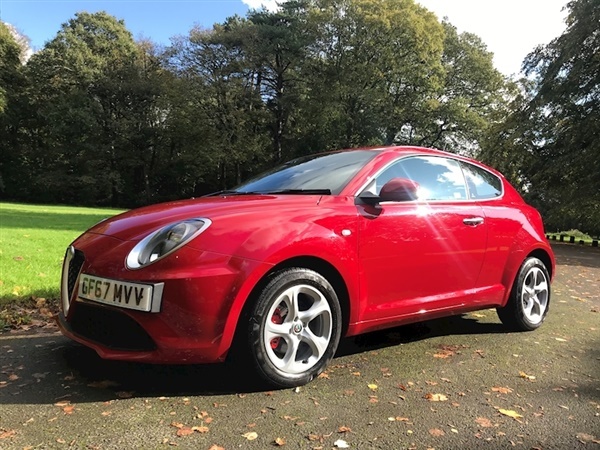 This Alfa Mito has covered only 4098 miles. This Mito is equipped with Alfa's DNA controller which allows you to choose the correct engine and suspension setting for the road conditions, outside temperature gauge with ice warning, Tyre pressure monitoring system, Automatic headlights, rear wash wipe, head restraints and 3x3 point seatbelts on all 4 seats, driver and front passenger front and side airbags, with the addition of drivers knee bags too. For your comfort and entertainment, it is equipped with Alfa's multi-function display, Power Steering, remote boot opening, trip computer, Radio/CD with MP3 player, adjustable headlights, electric one touch windows, electric heated and adjusted door mirrors, follow me home headlights, heated rear window, adjustable steering wheel with multi-function controls, reading lights and height adjustable seat.Its styling is very sporty and Alfa have included Chrome Tailpipes, leather steering wheel and gear knob, rear spoiler and satin effect headlight surrounds and door handles.